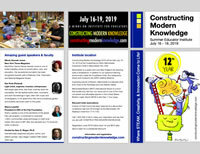 Constructing Modern Knowledge is thrilled to announce Dale Dougherty as the first guest speaker confirmed for CMK 2013, July 9-12, 2013. Proclaimed a “Champion of Change” by the White House, Dale Dougherty is the founder of Make magazine and the creator of the rapidly growing global phenomenon known as Maker Faire. He is currently publisher of Make and general manager of the Maker Media division of O’Reilly Media, Inc.
Maker Faire is the Greatest Show (and Tell) on Earth—a family-friendly festival of invention, creativity and resourcefulness, and a celebration of the Maker movement. Part science fair, part county fair, and part something entirely new, Maker Faire brings together a highly diversified group of individuals who are bound by a common thread to create. Through making, meeting, and sharing comes something very magical that leads to inspiration, education, innovation, and the next best thing. Dale Dougherty co-founded O’Reilly Media, a technical publisher and conference organizer known for its advocacy of Open Source and the Web. He coined the term “Web 2.0″ while developing the Web 2.0 Conference. He was the developer and publisher of Global Network Navigator (GNN), the first commercial Web site which launched in 1993 and was sold to AOL in 1995. Dale was developer and publisher of Web Review, the online magazine for Web designers, and he was O’Reilly’s first editor. Dougherty developed the Hacks series of books to “reclaim the term ‘hacking’ for the good guys,” and he’s the author of Sed & Awk. Dale Dougherty, editor and publisher of MAKE magazine interviews Steven Levy senior writer for Wired Magazine about Hackers Heroes of the Computer Revolution – 25th Anniversary Edition.